The Federal Open Market Committee (FOMC) statement released at 2 p.m. ET on September 26, 2018. The FOMC press conference with Chairman Jerome H. Powell will begin at 2:30 p.m. ET. Information received since the Federal Open Market Committee met in August indicates that the labor market has continued to strengthen and that economic activity has been rising at a strong rate. Job gains have been strong, on average, in recent months, and the unemployment rate has stayed low. Household spending and business fixed investment have grown strongly. On a 12-month basis, both overall inflation and inflation for items other than food and energy remain near 2 percent. Indicators of longer-term inflation expectations are little changed, on balance. Consistent with its statutory mandate, the Committee seeks to foster maximum employment and price stability. The Committee expects that further gradual increases in the target range for the federal funds rate will be consistent with sustained expansion of economic activity, strong labor market conditions, and inflation near the Committee's symmetric 2 percent objective over the medium term. Risks to the economic outlook appear roughly balanced. In view of realized and expected labor market conditions and inflation, the Committee decided to raise the target range for the federal funds rate to 2 to 2-1/4 percent. 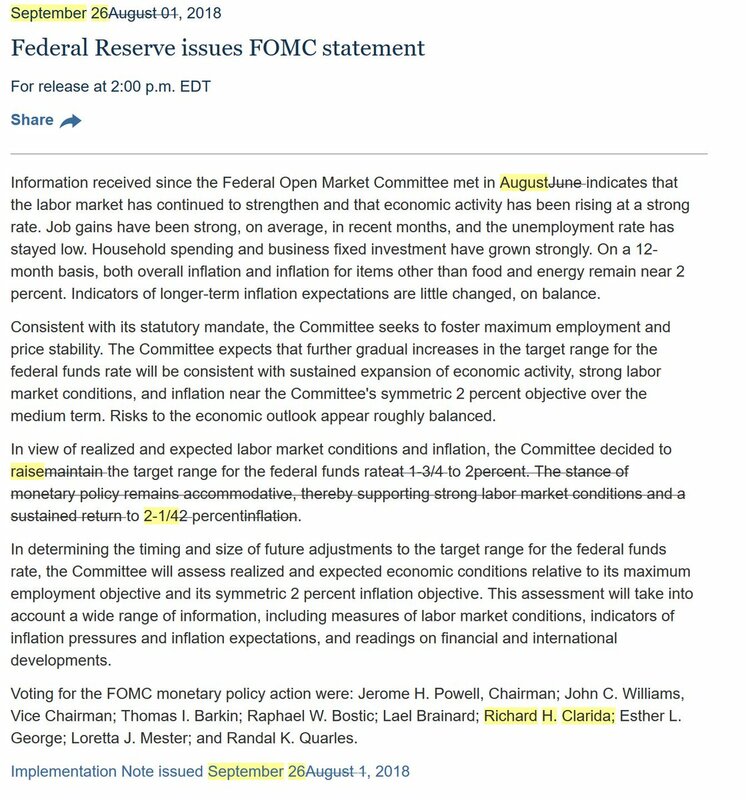 In determining the timing and size of future adjustments to the target range for the federal funds rate, the Committee will assess realized and expected economic conditions relative to its maximum employment objective and its symmetric 2 percent inflation objective.